Ah, holiday customs. At my house, we’ve developed a new one over the last year or two: after exchanging presents and eating Christmas dinner and pulling crackers (we lurrrrve Christmas crackers!) and nibbling at dessert, we usually play a rollicking game of Cards Against Humanity (my 81-year-old mom is a huge fan!) Although I would dearly love to write a Regency version of CAH some day (imagine the scurrilous things one could come up with to say about Prinny’s personal life! ), Regency family games were themselves somewhat less, er, naughty...and also a lot prettier. No, Lydia was not crowing over winning anchovies. Nor was Amabel handing out minnows, but these handsome little guys. The game was called “lottery tickets,” and was a game of pure chance; utilizing two decks of cards, it was played in rounds, and fish-shaped markers were used for placing bets (sort of), with the winner of each round getting the fish. Aren’t they lovely? These are of mother-of-pearl (which is darned difficult to photograph well, I’ll have you know! ), likely made in China, but they were also made of bone and ivory. Nor were they restricted to just fish shapes (I haven’t been able to discover ‘why fish?’) Here are several circular ones from my collection—again, Chinese mother-of-pearl, some very elegantly engraved. The wealthy would have theirs custom-carved with their coats of arms or other heraldic devices. While I ponder that question, I hope all NineteenTeen readers will enjoy a splendid upcoming holiday week full of your own happy family traditions, whether they involve fish or not. Speaking of P&P, do you happen to know what Kitty is working on in the Davies' version of the film when her father is forbidding her from Brighton and balls. I thought maybe is was paper quilting, but I'm not sure. Maybe it is mentioned in the book....it's been a long time since I've read the book. I just stumbled across this and now I wonder whether this predates using chips [poker chips] or is an early form. I'm not sure, Pooks. 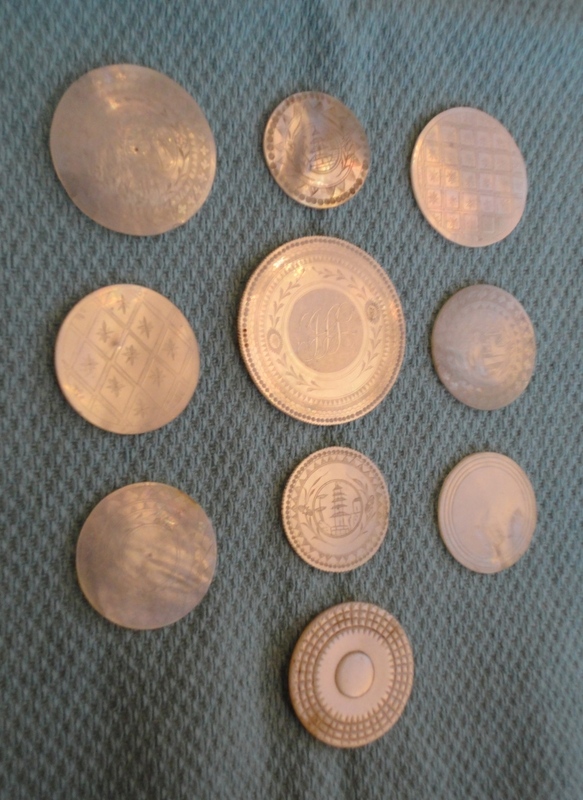 I don't know enough about the history of poker to know where it falls in relation to these, but the engraved personal tokens were definitely used in other gambling games to represent the bets one was placing. 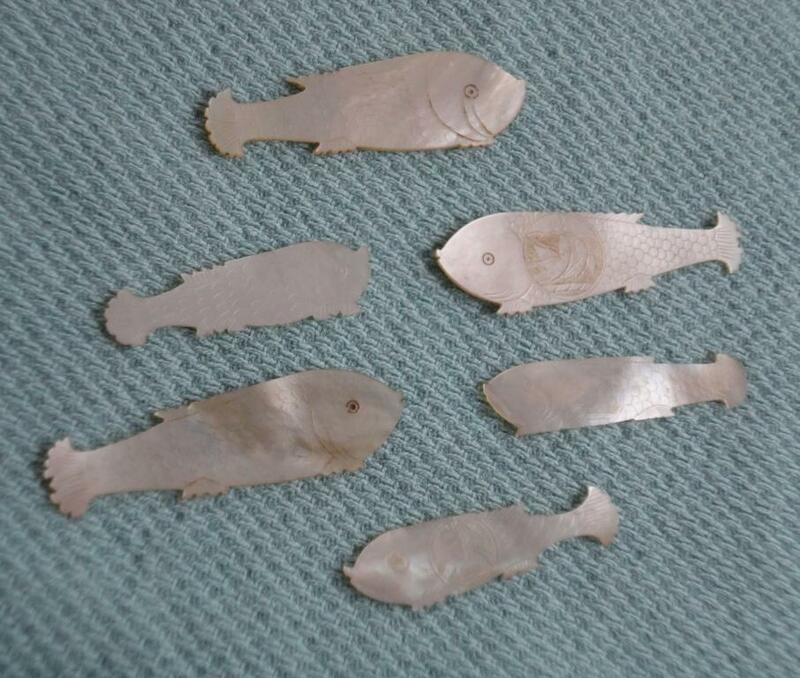 If the charms were made in China, it's likely that fish were chosen for several reasons. Fish have symbolized wealth and abundance for thousands of years. Also, the word for "carp" is pronounced the same for the symbols of "profit," "strength," and "power." And of course, there is the beautifully mythological "Carp Leaping Over the Dragon's Gate" -- I love that myth! -- which is a metaphor for overcoming obstacles. Winning a game of skill with a monetary prize would definitely make the fish an auspicious charm. Of course, if the fish charms were made in England, it might simply be that to an island nation, fish are always good luck: Food, oil, glue, fertilizer, and bone for tools and decorations. Again: a sign of luck and abundance, that you shall not want this winter. Just a couple cents to add to the discussion.